Are you having headache, stuffy nose, cough, nausea and others lately? Some people experienced these symptoms more often and with different levels of severity. It is important to know the possible causes behind and the underlying medical conditions that these signs indicated. Read on and be informed about the possible conditions and learn the best ways on how to properly manage them. What Causes Headache, Stuffy Nose, Cough, and Nausea? Common cold is a viral infection that affects the upper respiratory tract including the sinuses, nose, throat, and mouth. It is considered to be the most common illness in the world. This can spread easily due to exposure to the virus and direct contact from one person to another. Other symptoms that may be experienced by a person infected with a common cold include a sore throat, slight muscle and body pain, discomfort, fever, and loss of appetite. Most cases of common cold tend to get better on their own after a few days. Drink a lot of water or fluids and try steam-breathing to help alleviate the symptoms. Medications can be taken to give relief to the symptoms experienced. This may include decongestants and antihistamines to open the nasal passages and painkillers to reduce body aches and fever. Chronic sinusitis is the swelling of the sinuses leading to its blockage and improper draining. It is commonly caused by an infection from bacteria, virus, or fungi. This condition commonly occurs during spring and winter due to the occurrence of allergies and colds. Besides headache, stuffy nose, cough, nausea, other symptoms of sinusitis include bad breath, fatigue, fever, swelling, and pain which may last for about 12 weeks. Use different types of nasal sprays. Saline nasal spray moistens the nose while corticosteroid nasal spray reduces the inflammation. Use medications such as decongestants to relieve stuffy nose and painkillers to reduce the discomfort brought about by sinusitis. Antibiotics can also be taken if the causative agent of the infection is bacteria. Surgery may be done to properly clean and drain the sinuses. Migraine is a type of a headache that can bring severe pain lasting for about 4 to 72 hours. It is usually caused by the abnormal activities in the brain that are commonly triggered by stress, foods, and other factors. This condition may worsen with exposure to extreme lights and sounds, drinking alcohol, smoking, and sudden movements. Other common symptoms of a migraine include numbness or tingling sensation, throbbing, flickering visions, and sensitivity to sounds and lights. Severe cases of migraines may need prescription drugs including anti-nausea medicine, triptans, or sedatives. Pain relievers can also help relieve aches especially when taken immediately. Frequent migraine attacks can be prevented with the use of antidepressants, anti-seizure, and beta-blockers drugs. Botox injection in the forehead and neck muscles can also prevent a migraine. Tension headache is a common type of a headache brought about by muscle tensions especially in the face to the shoulder area. It is usually caused by stress, anxiety, depression, lack of sleep, bad posture, fatigue, and even hunger. This can occur every day, during the mid-day, and last for about three hours to seven days. Besides headache, stuffy nose, cough, nausea, other symptoms of a tension headache include stiff neck, discomfort, concentration problems, and pain radiating in the neck to the shoulders. Over-the-counter pain relievers can be taken to reduce the discomfort and prevent headaches brought about by the condition. Muscle relaxants can help lessen the muscle tensions that may lead to the pressure in the affected areas. Allergic reaction usually occurs when the body’s immunity system overreacts to the allergen present. Some of the most common allergens include dust, pollen, insect bites, medications, and foods. This condition may be mild, but can also be life-threatening especially when severe reactions known as anaphylaxis occurs. Mild allergic reactions may lead to redness of the skin, swelling of the sinus, and itchiness. Severe cases leading to anaphylaxis may cause joint and lip swelling, pain, discomfort, bloody colored stools, pale skin, sweating, confusions, and at times loss of consciousness. 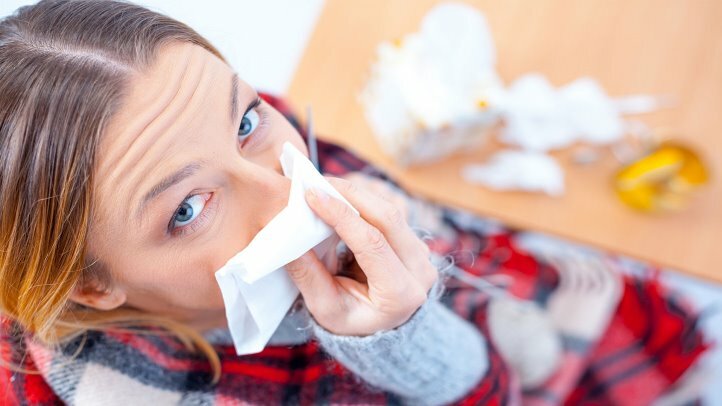 Mild allergies may be treated by avoiding the causative agent and taking drugs such as antihistamines and corticosteroids to reduce the pain and discomfort. Anti-inflammatory steroid cream can also help relieve the rashes and redness of the affected area. Emergency situations which normally involve anaphylaxis should be injected with epinephrine, which is a form of adrenalin medication. Oxygen and intravenous fluids may also be used to support the proper functioning of the bodily functions. Immunotherapy may be done to allergy patient to prevent the occurrence of future reactions. Hay fever is an allergic reaction caused by molds and outdoor pollens. This seasonal condition usually occurs during springtime and may last until fall depending on the allergy. Other symptoms of hay fever include itchiness and irritation of the eyes, fatigue, swelling, and burning sensation. Medications including antihistamines, decongestants, cortisones, and nasal sprays can be taken to lessen inflammation and swelling as well as to clear the nasal passages. Allergy shots and immunotherapy may help lessen the frequency and reduce the recurrence of the allergy. Nasal polyps are small, harmless, and non-cancerous inflamed tissue sacs that occur in the nasal passages. The small-sized polyps are usually asymptomatic while the larger ones have a tendency to cause blockage in the nasal area. Higher risk may be triggered by infections, asthma, allergies, and sensitivities to certain medications including aspirin. Besides headache, stuffy nose, cough, nausea, other symptoms of nasal polyps include infections of the sinuses, difficulty in breathing, loss of smell and taste, and severe snoring. Most of the nasal polyp cases don’t necessarily need treatments. Small-sized polyps can be given medications. Antihistamines and allergy medicines can help improve the symptoms of the nasal polyps while oral corticosteroids and steroid injections help reduce its size. If the polyps are already big and causing problems, surgery and removal of the polyps may be an option. After the procedure, it is important to use proper medications for allergies as well as asthma to be able to lessen the risk of recurring polyps. What Causes Dizziness and Hunger? What Causes Shaking and Migraine?